There are few times that you encounter greatness, and when you do it strikes you like a bolt of lightning. 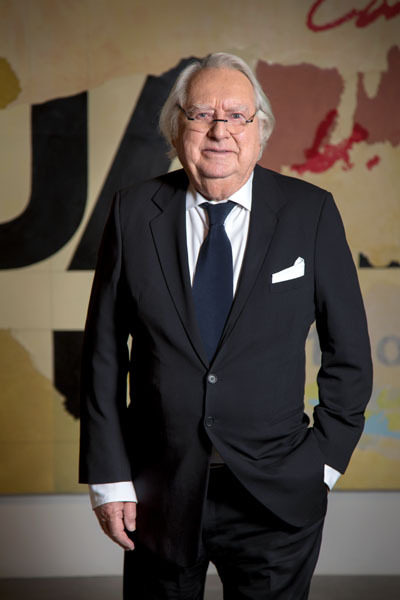 One of the New York Five, a famed group of progressive modernist architects, the Pritzker award winning architect Richard Meier has left an indelible influence on modern architecture today. 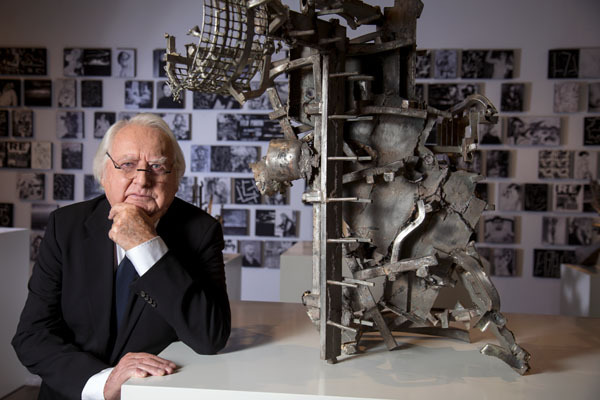 Though Meier is best known for his iconic architectural masterpieces and cultural institutions, he is also an acclaimed abstract artist whose broad body work spans from 1959 to the present day. On view at Sotheby’s S|2 Gallery from February 22-March 29, 2018 Richard Meier: Artist, will house over 30 pieces of works comprised of collages, encaustics, and silkscreens to be sold. Ahead of the exhibit, Meier’s cohosted The Art of Food at Sotheby’s with gastronomic powerhouse Claus Meyer where culinary creations were inspired by Meier’s collages. 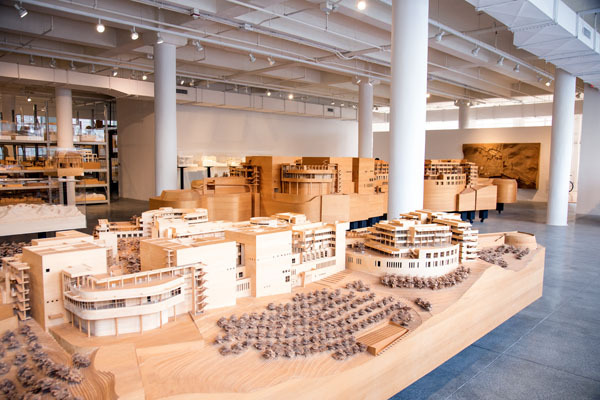 Here Resident Magazine caught up with the legendary Richard Meier at his Model Museum in Jersey City at the Mana Contemporary Art Center. 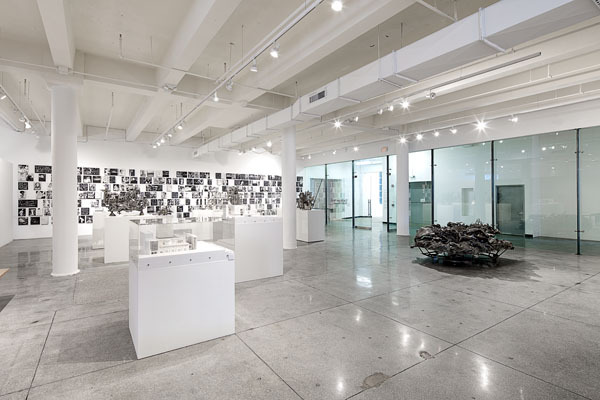 This expansive 15,000 square foot space houses his firm’s broad body of work with large scale architectural models from the 1960’s to the present, Meier’s abstract sculptures and collages along with his personal collection of books and magazines where visitors can experience his complex design process. Perhaps the most personal glimpse to Richard Meier’s life is in his collage where random personal objects collected over the years suddenly become cohesive and take on a new meaning. Like a scrapbook of a life well lived, one of his collages could have a handwritten note from Barbara Walters with a seating card from Bernard Arnault’s dinner, a boarding pass and a coat check ticket as he remembered that party where he sat with Babs and Hillary Clinton. This artistic side of Richard adds yet another dimension to this visionary’s mind and body of work which few can emulate, lending this icon to greatness. Frank Stella was a good friend of mine and I studied painting at night with Steven Green who was Frank’s teacher at Princeton. After class Frank, Steven & I would go out and have a beer together and we became friends. One day Steven said to me, ‘I don’t know why you are in class, you should just go out and paint.’ But I lived in a very small apartment, and I didn’t have any place to paint but Frank let me paint in his studio. When I was making 5’ x 7’ paintings Frank told me there wasn’t enough room for both of us. So I stopped doing the big paintings. I lived in a 2 room apartment and I slept in one room and started doing collages in the other because they were smaller. And I’ve been making collages ever since. Did you ever consider becoming an artist instead of an architect? There was a very short period of time when I was painting and practicing architecture. I realized that I had to make a choice and I decided to focus on architecture. What inspires you when assembling your collages? I have boxes with envelopes of stuff I’ve collected over the years — ticket stubs, old photographs, newspaper clippings, place cards, boarding passes, coat check tickets, you name it. These boxes of material may contain things that I collected years and years ago… Revisiting the material is a big part of what inspires me. What do you love about creating collages? The fact that you can work on them over time. As I look around at the collages that are on the wall, I see several that I would like to continue working on and so I will. Do your collages follow the same process as an architecture project? Not at all. Architecture is about creating a three-dimensional space that you move through, live in and occupy. It is directly related to human scale and is designed around that concept. With collages, the scale of the work is directly related to the scale of the material… and the process of creating collages is frequently spontaneous. The collages that I produce don’t have to be functional. They can be whatever I want them to be. How would you describe your body of art? I would say they are fragments of stories put together in some compositional way. When do you know when a piece is finished? Like cooking, if you have something on the stove, it’s finished before it burns. How did you get involved with Sotheby’s? Gary Lichtenstein (silkscreen printer and publisher) and I were working on prints together and Julian Dawes came to see our work. 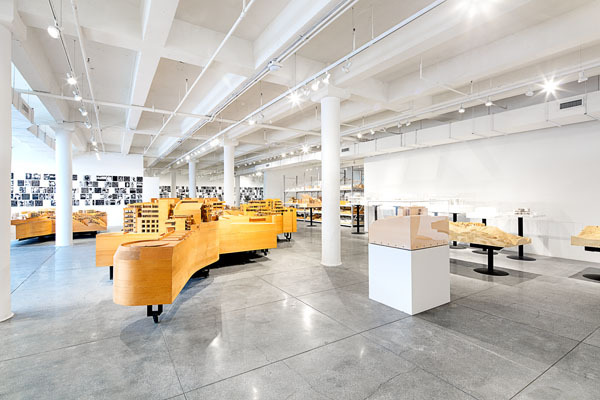 He proposed the exhibition at Sotheby’s S|2 Gallery and we are thrilled with this opportunity. Where do you draw your aesthetic from? Lately, the aesthetic has been the result of creative collaboration — Gary introduced me to the encaustic medium and it’s a terrific new approach to both collage-making and painting. Working with Gary is a give and take — we both bring our ideas to the table — and sometimes we embark upon something only to be surprised by completely unexpected results. Who are some of the luminaries that have inspired you? Are you an avid art collector? I don’t have a very large collection, but most of the work I have is by Frank Stella and by friends like Barnett Newman. Which project was your mea culpa? The Getty Center. It’s an amazing place. Do you use feng shui in any of your projects? No, I do not. When the Getty Center was finished, however, someone did bring in a Feng Shui expert who proclaimed it to be perfectly oriented. I couldn’t believe it. I knew nothing about it. Then again, some of it may be attributed to common sense — location, light, etc. We are doing a building on the East side of Manhattan just south of the United Nations and also a building on the West side of Manhattan on 61st Street and the Hudson River. We also have buildings in development in Bogota, Colombia, Mexico City, and Taiwan. What do you think of the future of the New York City skyline? New York City is ever changing — the skyline is changing… neighborhoods are changing. It’s extremely interesting to watch where brand new construction is happening versus re-design… and how dramatic architectural changes impact the dynamics of the neighborhoods (or blocks) that have remained largely untouched… the future of New York City’s skyline won’t ever be controlled by one person but there are certainly many who will contribute to it. Architecture is an art form which relates to the past and hopefully says something about the future. An architectural work is not something that changes rapidly so what is built is very important because people expect to live with it and relate to it for a long time. What are some of the new architectural trends you are seeing today? Everybody is concerned with environmental factors and how architecture takes those factors into consideration, specifically how architecture contributes to the environment.